Volpak SG horizontal pouch machine. THE Volpak SG horizontal pouch machine, represented by Selpak , is a new generation of horizontal packaging machines utilising recent advances in technology and precision that ensure a high level of efficiency and throughput. 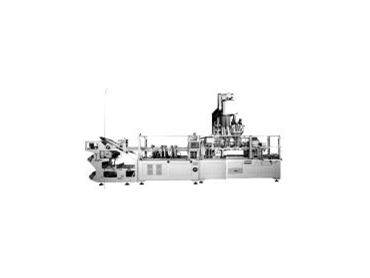 One of the most outstanding features of the SG range is the rapid change over procedure, due to easy access and automatic adjustment of its mechanisms, such as film transport device, pouch stretching device etc. The SG range boasts great flexibility and versatility, which makes it possible to make pouches with a capacity up to 9,000cc, along with medium size pouches up to 320 a minute. The equipment is easy to operate and maintain, great accessibility for cleaning, guaranteeing years of trouble free operation. The SG range of machines can handle a wide range of products, such as granules, powders, liquids, paste, towelettes in pouches with 3 or 4 sides, gusseted or stand up pouches and specially designed pouches, with easy reclosable systems such as zippers, caps, straws, degassing valves with outputs of up to 400/minute. Of interest is a joint venture project to package tuna into a flexible package. Volpak have joined forces with a leading canning machine manufacturer to provide 'tuna' dosing systems which is integrated on the Volpak machines. Volpak, of Barcelona Spain, provides complete 'flexible packaging" solutions from filling through to cartoning and case packing. The company is represented in Australia by the equipment powerhouse, Selpak Automation, who has enjoyed success with the new SG range.